Our Tank Weighing Systems are designed for weighing the amount of liquid or solid material filled into or discharged from industrial tanks, silos, bunkers, and mixers. These systems can be supplied with stainless steel and alloy steel load cells, available right from 20 kg to 500 ton capacities. We have the expertise to commission the systems for any type of applications such as normal, hygienic, high temperature, hazardous, corrosive, etc. Our unique concept of using pad plates ensures quick and accurate installation of load cells. 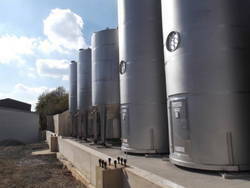 Looking for Tank Weighing Systems ?